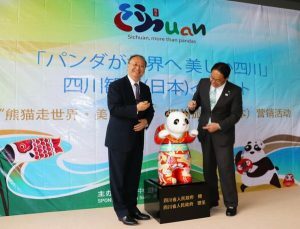 The opening ceremony of “Beautiful China, More than Pandas” Sichuan, China tourism promotion activities by Sichuan Tourism Development Committee was held at Yamanashi Prefecture’s County Square in Japan. The aims of these activities are to comprehensively promote the tourism resources in Sichuan, to attract more Japanese tourists to Sichuan and to promote the Sichuan culture. A painted giant panda dressed in kimono was presented to the government of Yamanashi Prefecture as a gift from the People’s Government of SichuanProvince. Yin Li, the governor of Sichuan and Hitoshi Goto, the governor of Yamanashi Prefecture, attended the event and added a finishing touch to the panda’s eyes as a symbol of the friendship between China and Japan. The painted giant panda will be displayed in Yamanashi Prefecture. Yin Li, the governor of Sichuan, introduced the beautiful scenery of Sichuanto the Japanese audiences and invited them to try Sichuan cuisine. The delicious and flavorful dishes immediately became a hit among the attendees. “There are pandas, beautiful scenery, and delicious cuisine in Sichuan. All of these will attract more Japanese tourists to Sichuan,” said Fujisawa, the governor of Yamanashi. During the promotion, various Sichuan tourism activities in Yamanashi Prefecture created a distinctive atmosphere, including a panda theme flash mob, panda painting activities, an exquisite photo exhibition of Sichuanculture and tourism resources, and a Sichuan cuisine tasting event. It’s a comprehensive presentation of Sichuan tourism to the people in Yamanashi Prefecture. The promotion was widely reported by Japanese media, including the Yamanashi TV that broadcast it live.